Har Krishan (Kishan) the youngest son of Guru Har Rai Sodhi, and had a brother, Ram Rai, nine years his senior, and a sister, Sarup Kaur, four years older. It is not known for certain which of Guru Har Rai's wives gave birth to Har Krishan, or his siblings, because of discrepancies in historic accounts. Historians conclude that the name of Har Krishan's mother was either Kishan (Krishan) Kaur or Sulakhni. Guru Har Krishan expired as child and so never married. He appointed as his successor, "Baba Bakale," meaning, "He of Bakala." More than 20 impostors claimed to be Guru before his uncle Teg Bahadar was inaugurated. Har Krishan was a child of five when his dying father, Guru Har Rai, appointed him to be the eighth guru of the Sikhs, a position coveted by Ram Rai. Guru Har Krishan was made to swear never to look upon the face of the Mughal emperor Aurangzeb nor be persuaded go to his court where Ram Rai was in residence. Ram Rai attempted to proclaim himself guru and plotted with Aurangzeb to have Guru Har Krishan brought to Delhi and denounced. Aurangzeb hoped to create a rift between the brothers and weaken the power of the Sikhs. Jai Singh, Raja of Ambar, acted as his emissary and invited the young Guru to Delhi. Guru Har Krishan made the trip from Kiratpur to Delhi by way of Panjokhra, passing through Ropar, Banur, Rajpura, and Ambala. Along the way he healed those afflicted with leprosy, comforting them with his own hands. A proud Brahman priest, Lal Chand, approached and challenged the young Guru to give a discourse on the Gita. The Guru responded asking that an illiterate water bearer named Chaju, who happened by, speak for him. Chaju humbled the Bhramin with an astonishing depth of intellectual knowledge and spiritual insight into scripture which only for the most learned and well versed of priests could have delivered. At the behest of Emperor Aurangzeb, Raja Jai Singh and his head Rani devised a deception to test Guru Har Krishan when he reached Delhi. The Raja invited the young Guru to visit the women's quarters of his palace telling him that the Rani and lesser queens wished to meet him. The Rani exchanged garments with a slave maiden and sat near the back of the assembly of women gathered to meet the young Guru. When the Guru was introduced, he tapped each noble women by turn on the shoulder with his scepter before dismissing them. He came to a woman in slave attire, and insisted that she was the Rani he had come to see. A small pox epidemic broke out in Delhi while Guru Har Krishan was in residence at there. The compassionate young Guru went through the city and personally tended to the needs of those suffering and so contracted the disease himself. The Sikhs removed him from the Raja's palace and carried him to the banks of the River Yamuna where he succumbed to the fever. When it became evident the Guru would expire, the Sikhs expressed grave concern because he had no heir and they feared the likes of Dhir Mal and Ram Rai. With his final breath, Guru Har Krishan indicated his successor would be found in the township of Bakala. Dates correspond to the Nanakshahi calendar. 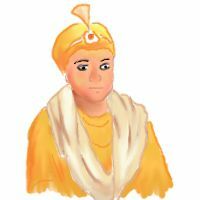 Birth: Kiratpur – July 23, 1656, Har Krishan (Har Kishan) is the youngest son of Guru Har Rai Sodhi. His mother is thought to be Kishan (Krishan) Kaur or Sulakhni. Inauguration as Guru: Kiratpur – October 20, 1661, Guru Har Rai appoints his youngest son Har Krishan to succeed him as Guru. Death: Delhi – April 16, 1664. Guru Har Krishan utters the words "Baba Bakale" indicating that his successor resided in Bakala. Much confusion ensues and 22 impostors set themselves up as his successor.